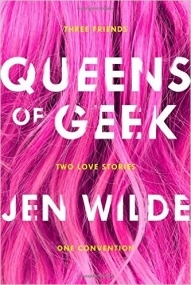 Queens of Geek by Jen Wilde is the most adorkable novel I’ve read in a long while. The book is ridiculously cute, but it also sends an important, hopeful message across through the main characters: that you don’t have to change yourself to fit in to someone else’s standards. What I love most about this book is that it’s a #LoveOzYA … which means THE CHARACTERS ARE AUSTRALIAN! Yay! For those who don’t know, I’ve decided to start reading more Australian YA fiction, and this book was probably the best one to start with because it’s so nerdy and relatable. Honestly, I can’t think of anyone who wouldn’t relate to this book as we have all, at one point in our lives, been immersed in fandom culture. This book is also amazingly diverse, which is apparent by the two narrators, Taylor and Charlie. Taylor is autistic and Charlie is bisexual and Asian. Obviously I can’t speak for whether the representation of Taylor was accurate or not, but Charlie’s bisexuality was portrayed beautifully. I can’t think of a time where I had read bisexuality so positively in a novel which doesn’t include a big coming out moment. I do love bisexual coming out stories and they most definitely have their place in both YA and adult fiction, but sometimes it’s comforting to have a character already secure with their sexuality. Taylor and Charlie were fantastic characters with distinct, personal voices. Despite how different they were, they were the very best of friends and I loved reading about how much they cared for each other and supported one another. Jaime is their friend from America who moved to Australia, and he was just a sweetheart who so deeply cared for Taylor. I adored his and Taylor’s budding romance. I have a small list of grievances (as in one thing) which didn’t affect my enjoyment of the book too much, but did irk me enough to not give this book 5 stars. The romance between Charlie and the vlogger girl featured that awful instalove trope (nooooooooooooooo) which is just not realistic. Authors, please stop featuring the instalove trope in your novels. The only time that trope is applicable is in like paranormal werewolf romances during that moment where the werewolf sets sight on his mate for the first time. (Yes, I used to read a lot of werewolf romances.) Aside from that, I don’t want to see it. One of the best elements of the book is how fandom positive it is. So often those of us in fandom circles are shamed or ridiculed by those outside the fandom for our love of geek culture (please put your hand up if you’ve ever been personally victimised by someone who doesn’t understand your love of a show/book/movie) but this book takes our love of geek culture and celebrates it. Queens of Geek is the fluffiest YA book I’ve ever read, and trust me when I say everyone will relate to it. You can still read the book on Wattpad here, so please give it a shot! Queens of Geek by Jen Wilde is a YA contemporary romance story with a LGBT relationship. It tells about three Senior BFFs : Taylor, Charlie and Jamie. Before finishing high school and then moving to LA to attend university, the three decide to go to SupaCon, a convention placed in San Diego, accomplishing their dream of a lifetime. The story alternates the point-of-view of Taylor and the point-of-view of Charlie. Charlie is a Chinese girl who has always lived in Australia and she has become famous vlogging on Youtube. She was very confident of herself but, after being publicly cheated on by her co-star Reese, she started having problems of self estimate. She goes to SupaCon to meet her fans and there she meets Alyssa Huntington, another vlogger she has always had a huge crush on. The two had a similar past, maybe too similar, but I enjoyed reading about them. Taylor is an autistic girl ( like the authoress ), and you could see it since the first pages of the book. She’s afraid of crowds and being left behind by Jamie and Charlie. Her dream is to meet the writer of the Firestone series, which helped her to overcome her daily struggle with social anxiety. She wants to meet Skyler before going to uni, because then she would have proved that she could win her problems with talking to people. By her side, there’s Jamie, her best friend who has always been there for her when she needed someone the most. He’s like a knight in shining armor who helps her damsel in distress. The two love each other since always, but Taylor is too afraid of not knowing what could happen to risk their friendship. Throughout the convention, Taylor has to face her problems and, in the end, she understands that she is strong, that being afraid is normal. Thanks to this book, I understood that being Geek is COOL, that shyness is not an invincible weakness, that is OK to have fears. Jen Wilde did a pretty good job with the writing and what I most liked about the story was how well she described Taylor. I know that some people think the only thing she could do was weeping, but I think it made the story more real. I recommend Queens of Geek to fans of LGBT and contemporary romance.